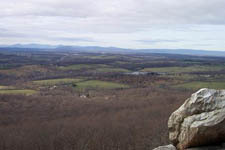 Description: The Bull Run Mountains Conservancy manages 800 acres of forest on the southern end of Bull Run Mountains. Despite its small size this venue has a fairly interesting network of trails. I rate most of the trails as easy although segments of the trails that follow the ridge can provide a pretty good cardio-vascular workout. For this reason I rate the overall hike as moderate. The primary loop is only about4.6 miles in length but additional out-and-backs to visit graveyards, mill and homestead ruins, quarry sites, a fantastic view of Fauquier County and a pretty unique trash dump puts the total mileage at about7.4 miles. This was also the scene of a very important Civil War military engagement, the Battle of Thoroughfare Gap, the results of which had major implications for the Second Battle of Manassas. 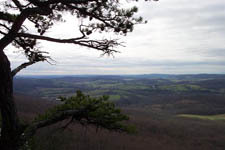 Visit The Bull Run Mountain Conservancy Site for more information. Hike begins at the Mountain House at the end of Beverly Mill Rd. 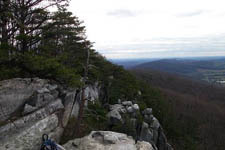 The High Point cliff area on the Bull Run Mountains Natural Area Preserve will be closed for an indefinite period of recovery and restoration starting January 15, 2015. The cliff area at High Point is a particularly fragile and significant natural community known as a Pine-Oak / Heath Woodland. 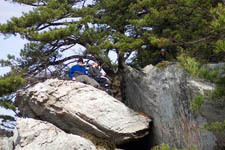 Both the vegetation and the geological formation that supports it represent important natural resources in Virginia that have been damaged by trampling. Sensitive species such as the eastern timber rattlesnake and the Table Mountain pine have been disturbed by high numbers of visitors. Six miles of public access trails in the preserve will remain open for hiking. The cliff area is part of the 2,500-acre preserve, but is privately owned. Access is managed under a license agreement that enables the Virginia Outdoors Foundation (VOF) to provide natural resource protection for the habitat while permitting the public to visit the cliffs. The closure will be implemented by VOF in accordance with a recovery plan designed in collaboration with the Virginia Department of Conservation and Recreation�s Division of Natural Heritage, whose staff will monitor the effects of closure on the damaged habitat. The duration of the closure will depend on the rate of recovery and the public�s adherence to current and future use guidelines. Visitors to the preserve must respect the closure of the High Point cliff area. At the time of closure, the Bull Run Ridge Trail beyond its juncture with Fern Hollow Trail and the Hickory Trail beyond its juncture with Quarry Trail will be closed. Ninety percent of the preserve is owned by VOF. The properties were officially dedicated as a State Natural Area Preserve in 2002 in recognition of their significant natural resources. The preserve straddles the border of Fauquier and Prince William counties. For questions and more information, contact Amanda Scheps at (540) 347-7727, ascheps@vofonline.org. 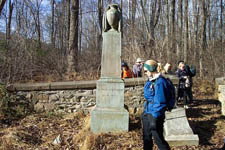 Trail Notes: The conservancy uses a unique trail marking system designed and installed by Boy Scouts. Each trail intersection has a post with colored discs. Note that there are still blazes on the trees. These are from previous management and may not match the color on the post. Post color has priority! Also, as of 11/05 the color coding of some trails have been changed and some trails have been combined. Unofficial, unsigned or unblazed trails are shown as orange on this map. The following description uses these changes. Some, but not all, of the intersections have signs. What is there is correct. Also note that the section of Ridge Trail north of the BRMC boundary is not under the Conservancy�s jurisdiction and is not blazed or maintained. 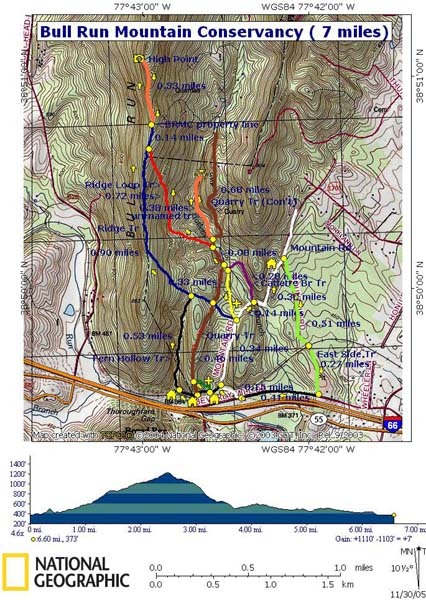 Finally, the map shows an �un-named� trail that parallels the Old Quarry Trail (Blue) and follows the northern portion of Cattlet�s Run. This is not an official trail but one worth exploring. Starting at the trailhead kiosk cross the railroad tracks. Soon come to the intersection of Mountain Rd (white disc) and a boardwalk (Now the beginning of Fern Hollow Tr - Black Disc). Turn left onto the board walk. Follow the trail to the first information post. Here are the remains of the Chapman home and an old ice house. Behind you is a side trail with a green disc - The Chapman Tr. Follow this to visit the Chapman Graveyard. Proceed to the top of the hill to view the Quarry trench at the junction of the Quarry Tr - Brown Disc). This section was originally called the Quarry Trench Tr. (There may not be a trail post at this junction. )All of the rock used to build the structures in this area came from this trench. Turn left and follow the Quarry Trail back to the Fern Hollow Tr. From this junction you�ll view what remains of Beverly Mill, constructed in the late 1700�s and destroyed by arsonists in 1998. Turn right at this junction and soon come to the ruins of another old mill as the Fern Hollow Trail (Black disc)turn right and begins a gradual ascent. 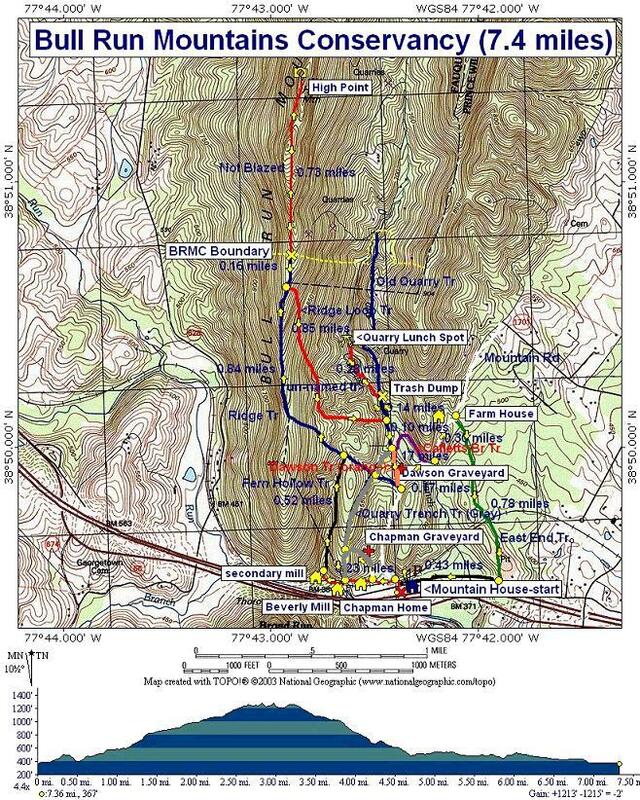 At 0.52 miles from the last mill arrive at the Ridge Tr (Blue disc). Turn left on the Ridge trail and continue to climb, steeply at first. As you reach the ridge line the trail will bear right onto an old woods road. In 0.9 miles pass the junction of the Ridge loop Trail (Red disc but might look orange due to fading) on the right. The trail post is on the left. In another 0.16 miles you�ll be off of Conservancy property. Continue to follow the old road for another 0.33 miles. You�ll have to work your way around some fallen trees but keep bearing to the west to find the trail. Shortly after leaving the conservancy the trail splits, just behind a fallen tree. You want to bear to the left, staying in sight of the ridge. As you near the crest of the hill the trail and ridge line come closer together. At this point there is a great viewing platform called High Point to the left with an unobstructed view of Fauquier County and the Blue Ridge Mountains. Return to the junction of the Ridge Loop Tr (red disc) and turn left onto it. In 0.72 miles descend to a hollow and the junction of the Quarry Trail (Brown disc). Turn left, crossing Cattlet�s Branch, and follow the trail along a bench next to the stream until you reach an obvious trash dump on the right. Here you will find items of antiquity dating back beyond the 60�s. The continuation of Old Quarry trail is on a hill on the north side of the pile and can be a bit hard to find. I prefer to stay on the streamside bench and follow it on an unofficial trail until you come to a small pile of branches and thin logs laying across the trail. Cross the stream here and turn right. The trail is usually obvious to follow. In more vague spots there will be some thin logs laying parallel to the intended path. At about 0.38 miles from the last trail junction you will see an old quarry area with stone seats on the opposite bank. I like to take a break here. There are supposed to be more stone ruins further north of this point but I�ve yet to explore that far up. Retrace your steps to the junction of the Ridge Loop Tr and continue south on the Quarry Trail (Brown disc). In about 0.1 miles come to the junction of the Dawson Tr (yellow disc) on the left. Turn left. Pass Cattlet�s Branch Trail (wine/purple disc) on the left, Staying on Dawson's Tr. Climb a slight hill. On the right will be the foundation of the old Dawson farm house. 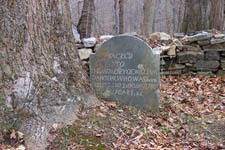 As you descend, a trail leading to the Dawson Graveyard is to the left. At 0.33 miles from the last trail junction arrive at the Mountain Rd (White disc). If you choose to end the hike early a right turn here will find you back at the car in about 0.4 miles. Otherwise, turn left, descend, pass Catlett�s Br Tr on the left and cross Catlett�s Br. Soon pass an old farm house on the left and turn right onto East End Trail (about 0.47 miles from the junction with Dawson Tr, It has a lime Green disc). Follow this back to Beverly Mill Rd, crossing the tracks as you go. At 0.78 miles from the previous trail junction come to Beverly Mills Rd. Turn right here and walk 0.43 miles back to the car. Critique: This is an excellent day hike that offers some spectacular views! Use the Conservancy's map--which you can get at the kiosk at the main trailhead. Follow the colored circles associated with each trail and you should be fine. When taking the Ridge Trail to the peak, definitely go beyond the park boundary and map to the top (which you can easily see). No longer do you need to go around the fence - the trail now continues onward and a sign tells you you're leaving the park and that it's OK to do so. We took the hike with a few inches of snow on the ground - beautiful! Now we'll need to come back in the spring. Critique: Did the described loop as a trail run minus the spur on the Quarry Tr to the ruins. The area is rather small, the "mountain" is not very big, and it can get crowded on nice weekends. However, this is definitely the biggest climb and the best view this close to DC in VA. Nice mix of trails for running. Coming down from the overlook on the singletrack is a blast, as is the trail along the eastern edge of the property that crosses the RR tracks. 1) There are no more colored discs or blazes (except faded leftovers. The Conservancy uses a system with numbered posts at each trail junction. The trails are pretty well-maintained and are still easy to navigate. Check out the map here: http://brmconservancy.org/trail_map.html. 2. If you visit the Chapman Graveyard and the Quarry Trench at the beginning of loop, you cann no longer cut back directly down to the Fern Hollow Tr. You need to retrace your steps or continue up the Quarry Tr to the Chestnut Ridge Tr and turn left to rejoin the described route. Critique: A very nice, moderate, short hike. The old historic sites are really interesting and worth seeing, and the trip up to High Point is the highlight of this hike. I would advise skipping the out and back section of the quarry trail, the trail is really quite hard to follow and there isn't much there. However, if you like looking at old foundational ruins the author is correct that there are some ruins further north up the stream on the West side, though again the trail is very hard to follow. The trail marking system in the conservancy was really disappointing. Most all of the old blazes are worn away, so in some of the parts of the system where the trail is hard to follow you're not exactly sure if you're still on the right trail. Definitely bring the park map with you on the hike-it labels all of the intersections with the numbers that the conservancy uses on the trails. There should be one at the main kiosk. Overall a good hike that I would recommend for a a fun afternoon. Critique: Hike in, cross the tracks, follow mountain road trail, (across wooed walkway) turn left at marker one and parallel the tracks, you will see the ice house, (Cemetery on right marked by box on park map) the bottom of the trench, the mill and the old house. Follow trail to the marker 4. You will see the old home site and secondary mill site. Follow fern hollow trail to marker 9, turn left, follow ridge trail. You will see summit points on the left. At the end is a fence barricade showing the park boundary, turn right and follow down. At marker 13, turn right. At marker 10, left turn. At marker 11, turn right on to damsons trail. On Dawson's, old home site on right (its an old "clearing" you will miss it if you arent diligent) and the trail to the Dawson graveyard on left. VERY OLD. Follow Dawson to the intersection with markers 6 and seven. You can come back in on alternate trail or the mountain trail. (We smelled bear while on the mountain road trail on our afternoon hike as the sun went down!) Both are nice ends, alternate will rise back up, mountain road steadily declines. Cant tell you the distance but is a good hike. I'll hike with a pedometer and get back to you. I hiked it with my nine year old son in 2 hours. This is a nice historical hike and a nice stretch of the legs with views thrown in. DOWNSIDE-city folk bringing in dogs when they shouldn't. Critique: This hike is very scenic with much history behind it. Located in the Thoroughfare gap, it was the site of Civil War battles and staging. Mountain Rd that traverses the 800 acres also has a rich history associated with it. Downsides include the restrictions placed on pets, and an extensive waiver that you are requested to sign before hiking if you are not a BRMC member. The trails are lightly used as you would imagine for a park that has no roadway signs that would indicate you are near the trail head, or that you have arrived until you reach the stone house at the dead end of the road. Keep searching, the hike is worth it! You will enjoy mountain views without wasting a drive to the Appalachian mountains for a several hour nature outing. Critique: Beautiful hike. Rain has really washed a lot of the pollen/dust off of the trees and undergrowth and the scenery was really spectacular. Graveyards and ruins make really neat side features to this hike. High Point was really worth the trip. Saw 3 nesting hawks flying below us. Only downside is all the rain has turned the first part of the trail before and after the boardwalk into a river. Literally. Boards have been sporadically placed in spots but be prepared to get wet. At a few places along the way the intense washout does make it hard to follow the trails. I'm sure this will go down eventually but for now its something to watch for. Also blowdowns in several areas that appear to have been cleaned up for the most part. Second downside, two hikers we came across at High Point that brought their dogs on this hike. While the signs clearly denote no dogs I guess people have a hard time reading.